Four vessels—HMAS Canberra, HMAS Success, HMAS Newcastle, and HMAS Parramata—arrived in Sri Lanka. 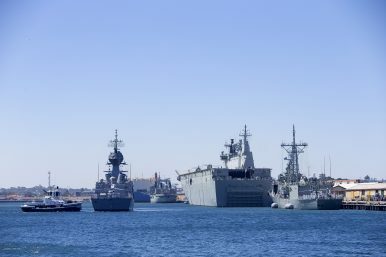 The Royal Australian Navy (RAN) has started a major deployment under the Indo-Pacific Endeavor 2019 banner. Four vessels — HMAS Canberra, HMAS Success, HMAS Newcastle, and HMAS Parramata — arrived in Sri Lanka to begin the first set of activities there. The deployment began on March 11. In Sri Lanka, the RAN will provide training on humanitarian assistance and disaster relief operations as well as deepen its interactions with the Sri Lankan Navy. “This initiative is designed to promote security and stability in Australia’s near region through bilateral and multilateral engagement, training and capacity building and Australia is committed to developing strong and positive defence relations with regional nations through dialogue and practical activities,” said Capt. Sean Unwin, the Australian High Commission in Colombo’s defense advisor, according to local media reports. Following its activities in Sri Lanka, the RAN task group will join the Indian Navy for exercises and interactions as well. “Engagement with India, one of Australia’s key strategic partners in the Indian Ocean region, will be the cornerstone for [Indo-Pacific Endeavor 2019] with a number of high-level activities to be conducted to showcase the breadth and depth of our bilateral relationship,” an Australian Department of Defense release noted in December 2018. India and Australia, along with Japan and the United States, have been consulting since November 2017 as part of a quadrilateral consultative group. The talks have been talking place at the working-level and all four countries have identified a common interest in a rules-based order in the region. The RAN has yet to be invited to participate in the trilateral U.S.-India-Japan MALABAR naval exercise. As part of this year’s Indo-Pacific Endeavor, Australia and India will hold the latest biennial iteration of their bilateral AUSINDEX naval exercises. The RAN task group for Indo-Pacific Endeavor 2019 is lead by the flagship HMAS Canberra, the lead ship of the Canberra-class landing helicopter dock vessel. HMAS Canberra is the largest vessel in the RAN’s inventory. A Swedish shipyard’s troubles and Australia’s quest for new submarines.